Note that you will need about 2 medium lemons for the juice and zest used throughout this recipe. Also, these buns come together relatively quickly, but the Prep time does not include rising time. This is a great recipe to bake while puttering around the house. Warm the milk beverage to 115°F in a small saucepan. Stir in the yeast and ½ teaspoon sugar and let sit 5 minutes. In a large mixing bowl, combine the ⅓ cup sugar, buttery spread, egg, lemon juice, zest, and salt. Add the yeast mixture and stir well for 1 minute. Add 1½ cups of the flour and mix for 1 minute. Add the remaining flour and stir to make a soft dough. Turn the dough out onto a floured surface. Knead until smooth, elastic, and no longer sticky, about 5 minutes. Place the dough in a greased bowl, turning to coat. Cover and let set in a warm place for 2 hours, or until doubled in bulk. Stir together the sugar, buttery spread, flour and lemon zest until it forms a paste. Roll the dough on a lightly floured surface to form a rectangle measuring 12x16-inch. Spread the filling over the rectangle and distribute the fresh blueberries on top. Roll the dough up tightly from the long end. Slice into 12 equal pieces. Place the rolls, cut sides up into a greased 9x13-inch baking pan. Cover and let sit in a warm place for 1 hour. Bake the buns in a preheated 350°F oven for 24 minutes, or until lightly browned. Remove the pan to a cooling rack and let cool while you make the frosting. In a medium bowl, whisk the powdered sugar, buttery spread, and lemon juice until smooth. 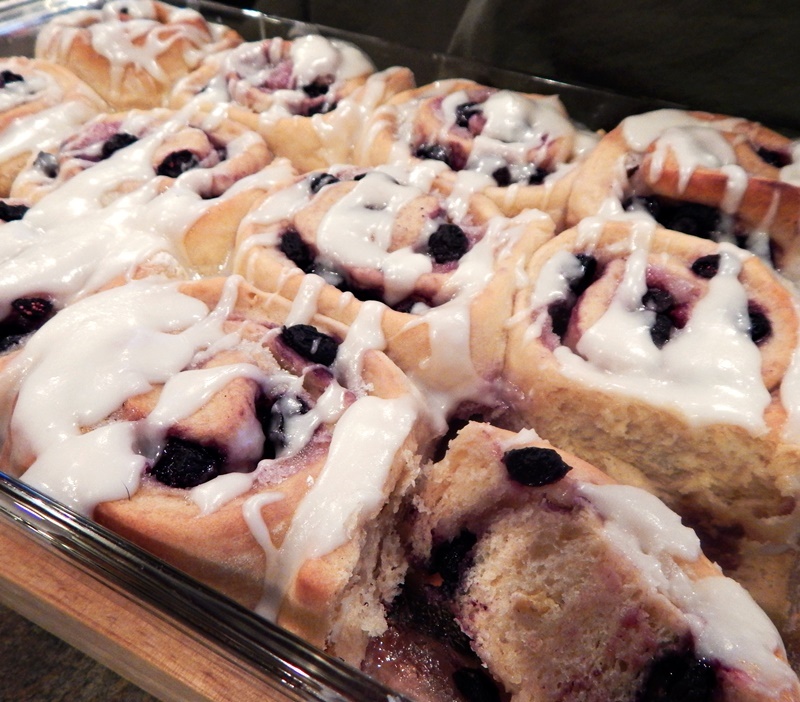 Drizzle over the warm rolls.Sprinkle the lemon zest garnish atop the iced blueberry breakfast buns.